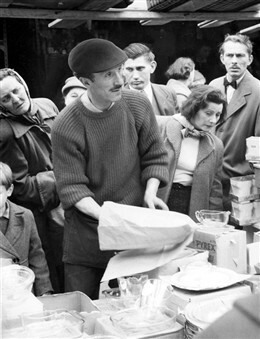 Over time, traders have come from far and wide to sell their goods in the Church Street Market. Fruit and vegetables, fish, international food and clothes stalls can all be seen on the stalls of Church Street as you walk from one end of the street to the other. The market has seen many changes over the years and a variety of traders have come and gone. For many years and for a few stallholders still, Church Street Market has been something of a tradition, especially amongst some of the current stalls where the trade has been passed down the family from generation to generation. 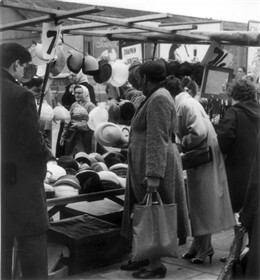 Although Church Street is still well known for its Antiques shops, it also used to have a number of antiques stalls which used to trade outside what is now known as Alfie’s Antiques. Fine jewellery were among some of the gems that could be found amongst these stalls. This page was added on 22/03/2010. “When we came to the market years ago, we spend two to three hours, but today it is not the same, could do with a facelift”. Saturdays used to be Church Street to get the veg and then once the shopping was done it would be apple fritters or cockles and welks, depending on the weather and if you were in the money you could have both. Oh yes- apple fritters were what my brother and myself lived for. We also used to love frozen jublies bought from a sweet shop , cant remember where that was. Wasn't the sweet shop next to the toyshop (Iversons) ? - I love those fritters! I had a Saturday job in Rosin's the bakers on the corner of Salisbury Street (I think). Then I worked in the shoe department of Jordan's - they even had a small canteen. It was a lovely place to work - everyone was so nice to you! I think Iverson's was the chemist. 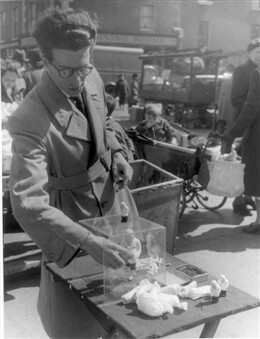 Does anyone remember the stall where the man used to chop up live eels and scoop them into the jars of jelly? Alas I heard with sadness today Tubby Isaacs is no more.... my old mum loved his jellied eels! I remember the pie and eel shop where you could see the eels wriggling away outside. They were delicious and my Grandad Clancy used to treat us kids to a lunch there before going to the kids matinee on Saturday afternoons. That was in the late 20's and early 30's! I was born in Ashmill street (98) in 1923! I lived near Church Street from my birth in 1950 until we moved in 1960. We went to the market every Saturday. My mum never forgave me for throwing the eggs out of my pram when they were still rationed. Our trip always started with pie and mash then the stalls to get the fruit and veg. I am sure I can remember a time when girls with big skirts were jiving to 'Rock Around The Clock'. I can also remember the day one of my teeth fell out while we were queuing for some meat. When I was big enough I would have to look after my little brother in his pram while Mum went into the shops. Best of all was when the shopping was done and we had the apple fritter. My most delicious childhood memory. I would love to have another.